This venue hosts a wide variety of entertainment opportunities. Concerts, sports, circuses, expos, festivals, cook-offs, conferences and trade shows are just a few of the events regularly scheduled at the arena. 16 miles away. Observe artisans creating unique handmade glassware that is famous throughout the world. Only outlet for national manufacturer glass and historical museum. Located only one block from Pullman Plaza, this park stretches along the Ohio River bordering the downtown area of Huntington. The park provides a tranquil setting and beautiful scenery for family outings, picnics, peaceful or romantic walks along the river, as well fishing and boating. Step back in time at the Heritage Farm Museum and Village for a fun-filled, educational and award-winning experience. The museum is the finest in the state and provides exhibits from arts all over the world. One of Huntington's special treasures... From the earliest steam car to Model Ts, Model A Fords, touring cars, convertibles, and customs. A rare 1930 V-16 Cadillac Limousine and a 1936 Chrysler Convertible are among the more elegant examples of auto development and design. Just block away, Marshall is home to the Thundering Herd. During the peak autumn foliage time you can take a day trip from Huntington to Hinton, WV. You will have a front-row seat to some of the most spectacular scenery in the country. Traveling along the beautiful New River Gorge in southern West Virginia. Reservations are a must – call today to get tickets! 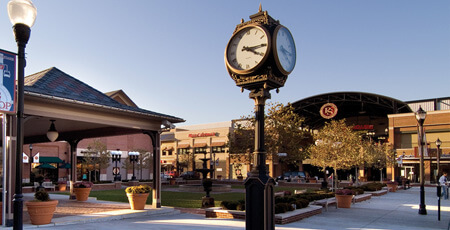 Located across the street from Pullman Plaza, Pullman Square is the hub of downtown. It houses numerous dining, retail and entertainment businesses, as well as a 16-screen movie theater. One of the most peaceful and serene locations in the city. The park provides recreational opportunities as well as year-round events and activities for everyone's enjoyment. These include a walking/jogging path, tennis courts, playground and picnic and outdoor amphitheater. Ironton, Ohio has many places for different types of recreation. The Ironton River includes a scenic view, a boat dock for boating, and a wonderful place for fishing. Located around Ironton are several small parks, including Wayne National Forest. It also features hiking, ATV, and horse trails, camp sites, fishing, and boating. Operating as a non-profit organization since 1972 offers the best of the performing arts to our patrons. The theatre has seating for 1400 people and an average of 120 performances per year. The center strives to encourage and nurture artistic creativity, by providing a supportive and inspiring environment for artists and by offering art exhibitions, events and educational programs that raise public awareness and appreciation for the arts.